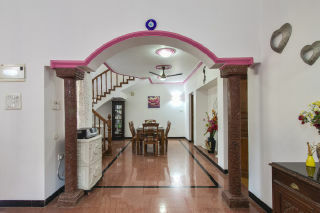 This is an offering of a splendid villa which houses three bedrooms. 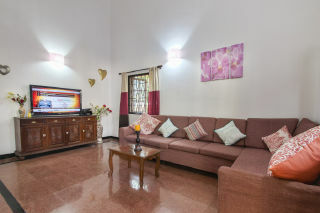 It can accommodate up to nine people and is ideal for a group of friends looking for a leisure beach holiday. This property features a shared swimming pool. Housekeeping services are provided to make your stay comfortable. Parking space is available for the guests. 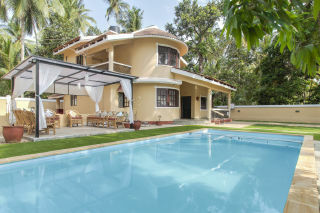 Your Space The villa is set amidst ample coconut palms. As you walk in through the gates, you are welcomed by a lovely outdoor pool with a pergola on the decks that houses ample seating where you can relax after a refreshing swim. Inside, the living room boasts a large flat-screen TV, with a contemporary L-shaped couch that provides comfortable seating. The room extends into the dining space which features a six-seat dinette for your mealtime convenience. 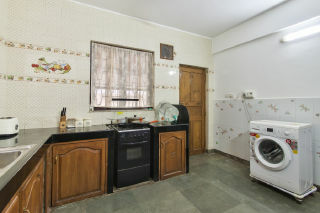 A modular kitchen with marble countertops, essential crockery, a gas cooking range with an oven, a microwave, a toaster, an electric kettle, and a refrigerator make it possible for you to relish home-cooked meals even on holiday; a washing machine ensures all your laundry needs are taken care of. The bedrooms on offer have a contemporary décor, with comfortable beds with side tables, cane arm chairs and cupboards for your storage convenience. The rooms are air-conditioned. The en suite bathrooms are well-tiled and equipped with modern sanitary ware. 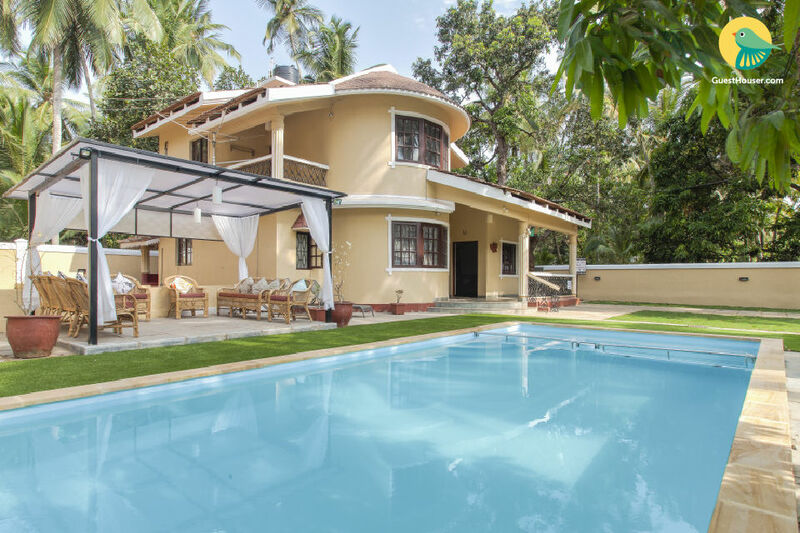 Located on Adventure Street, in the heart of Calangute, this property is a private 3 bedroom luxury villa with all facilities needed for a comfortable and peaceful stay. 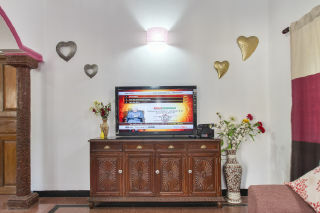 Rooms are quite spacious and air conditioned, with one room on the ground floor and other two on the first floor. 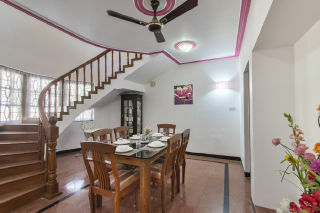 The property also includes a well stocked kitchen, a spacious dining room, balconies and two fully furnished bathrooms. The private garden is well maintained with hammocks. 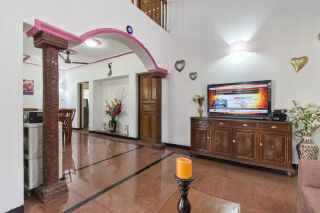 The property is at a walking distance (10 minutes) from Calangute beach and the market, bars, casinos and restaurants are at a walkable distance. This property holds great value for money and is best suited for large families or groups and can comfortable accommodate a group of 10 people. The place is really nice, and well equipped. Well maintained and quite clean. However, the pool in not as big as shown in the pictures. It is quite small. Rest everything is as shown or better than the pictures. Host was also nice to us and we were completely satisfied with the services. Thivim Railway Station is 19 kilometers. Dabolim Airport is 38 kilometers from Calanguate.